Enter your postcode below for the best Sky deals in your area! Free Wi-Fi access from The Cloud. Includes Sky Hub wireless router, Sky Broadband Shield security. *Prices increasing from 1st April 2019. Up to 1Mb upload speed. 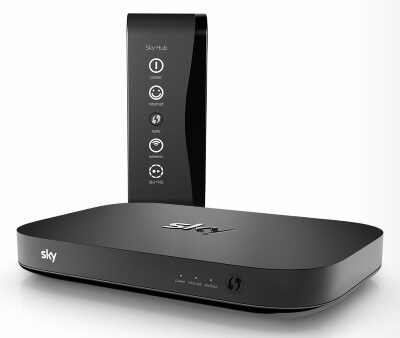 Free Wi-Fi access from The Cloud, Sky Hub wireless router and Sky Broadband Shield Security. *Prices increasing from 1st April 2019. The Sky we know today was the result of Sky Television and British Satellite Broadcasting merging in 1990. Its fully digital TV service was launched (quite literally, with the Astra 2A satellite) in 1997, since then it has moved from strength to strength. While Sky is best known for its satellite TV it’s also a leading provider of fixed line ADSL and fibre optic broadband services. Sky Broadband began life as EasyNet, which was purchased by BSkyB in 2005. Since then Sky has bought O2 and Be Broadband into the fold and grown to become one of the biggest ISPs in the UK, with more than 6 million subscribers around the UK. Sky broadband deals cover the full breadth of home communications and entertainment. Its wide choice of services include low cost ADSL internet, superfast fibre optic broadband, home phone and calling packages and broadband and TV bundles, plus mobile services too! And there are always plenty of special offers, including free Sky Broadband deals, reward vouchers and student broadband packages. Sky provides fixed line home broadband using the BT Openreach network. This means that Sky offers either ADSL services (11Mb average speed) or fibre optic broadband (36Mb or 63Mb average speed) using a landline telephone. It also means Sky is subject to standard Openreach-network activation times; check out our guide for more on Sky installation times. All Sky broadband packages include a landline telephone service. Even if you don’t use it for voice calls this is required for the broadband. The price you see for Sky Broadband deals is the monthly cost for both the broadband and line rental. Sky’s famous satellite TV service offers hundreds of channels and loads more content on demand. You don’t have to be a Sky TV customer to get Sky Broadband, or vice versa, but their bundles combining TV, phone and broadband can offer great value. If you’re looking for just a Sky TV service only you can compare deals on our TV only page. Sky has now branched out into mobile, offering some competitive mobile phone plans powered by the O2 network. Sky TV customers benefit from free calls and texting, and only need to pay for their chosen data bundle. Those looking for budget broadband will be well served by Sky’s entry level ADSL broadband packages. These are frequently available with money off for the first year, with low running costs after the discount period ends. However, it is worth that Sky deals rarely offer free setup, so you will likely have to pay a installation fee. Sky Fibre broadband offers average download speeds of 36Mb or 63Mb and the unlimited packages are truly unlimited with no sneaky small print clauses, so big downloads aren’t an issue. Upload speeds of up to 10Mb or up to 20Mb on Sky Fibre Max will also prove useful for YouTube and Twitch streaming and hosting online games. Sky Broadband is one of a handful of ISPs which offer specialist student broadband deals. These provide unlimited broadband on shorter contracts of nine months, to fit term times. However they are only available for short periods during the year, so keep an eye out. Sky is of course a TV provider too, and you can opt to purchase broadband and TV in a bundle, potentially saving money over using separate phone, TV and broadband only services. Sky Broadband and TV bundles can include sports, movies and entertainment channels, though there’s plenty of flexibility and you can add or remove channel bundles at any time without cost. The Sky Hub Wi-Fi router is used to connect to the internet and share the broadband around your home using either wireless networking or wired network cables. The Cloud is Sky’s public Wi-Fi hotspot network. All Sky users get free access to The Cloud nationwide, so you can stay connected outside the home without using up your mobile data allowance. Sky offers internet filtering tools for parents who are concerned about their kids getting access to unsuitable content. It can be setup using age ratings or block specific sites, and a watershed features allows you to automatically disable the filter at certain times. Sky also provides a free McAfee Security trial for anti-virus protection. Sky Broadband internet, in common with many other broadband providers, uses the BT Openreach infrastructure. However it does operate its own Local Loop Unbundled (LLU) network, which means that if you lie outside of the Sky network area your options will be far more limited. It is always important to check your broadband coverage to find out exactly what type of broadband you might be able to get. To get started you can enter your home postcode into the postcode field on our comparison tables. This will filter by location to show the internet deals available in your area. Sky offers broadband using either ADSL or fibre optic technology; many homes will have the choice of either though in some cases your options may be more restricted. ADSL should be available to almost everybody, though a minority may find that they are not in a Sky network area. You will still be able to get Sky Broadband using the Sky Broadband Connect package, but speeds will be restricted to a maximum of 6Mb. If fibre optic broadband is an option you can enjoy download speeds averaging 36Mb or 63Mb, depending on the type of Sky broadband package you choose. Fibre broadband is not as widespread as ADSL but is now available to more than 80% of UK premises. If you’re outside the Sky network are your only option will be Sky Broadband Connect. This is an ADSL connection up to 6Mb, which is much slower than standard Sky Broadband but it does include unlimited usage. When signing up to Sky Broadband they will check your services at your address and provide a speed estimate before the order progresses, so you’ll know exactly what you’re getting before paying any money or agreeing to a contract. You must also pass a credit check to get Sky, but if this a problem you can choose a no credit check deal, including options from Sky spinoff NOW Broadband. Sky Broadband is available using either ADSL or fibre optic broadband technology, offering a total of four different maximum speeds to suit the needs of most home users. But which one is right for you? ADSL broadband uses the BT telephone lines to offer download speeds of up to 17Mb and upload rates of up to 512Kb. It is important to note that the exact speed of an ADSL connection is dependent on how far you are from the exchange, but when signing up with Sky Broadband you will be given an accurate speed estimation. Some exchanges are not included in the Sky network, so your maximum speed will be 6Mb using the Sky Broadband Connect package. ADSL is the cheapest type of broadband and perfectly sufficient for many home users. It offers enough speed for web browsing and social media, while still being able to cope with video streaming, online gaming and other more demanding tasks. Fibre optic broadband is best suited to heavier usage, or homes where the connection is shared among multiple users, such as families and student houses. In addition to much faster download speeds it also provides an upload speed of up to 10Mb or 20Mb, which is useful for online gamers or anyone who regularly uploads large files such as YouTube videos. Fibre broadband technology also provides an actual speed which is much closer to the quoted rates, though again you will be given a speed estimate when signing up with Sky. Fibre broadband is a little more expensive than ADSL but still very affordable, and as it’s now available to more than 80% of premises it’s something that many of us will be able to choose if we want to enjoy everything the internet has to offer without ever worrying about performance. Sky offers both limited and unlimited broadband. You can purchase inexpensive ADSL and fibre packages with monthly usage caps, however we would generally recommend opting for an unlimited Sky broadband deal instead. They do not cost much more, and you never need to worry about extra fees or service restrictions..
Sky unlimited deals are truly unlimited - there are no hidden fair use policies and Sky does not use traffic management to slow the connection at peak times. Perhaps Sky’s biggest strength is its ability to offer a complete home entertainment bundle under one roof. With TV, phone, broadband and now mobile, you can get everything sorted for one monthly price, with one point of contact for support. And none of these services feel compromised - the broadband is on a par with competitors, and better than many with truly unlimited usage. The deals include lots of extras too, such as free public Wi-Fi hotspots. Sky has also done much to improve its reputation when it comes to after-sales support, and in recent years has been highly rated for tech support and customer service in our home broadband survey. The downsides are fairly minor. We would not generally recommend the limited fibre package, as 25GB is a very small amount of data for superfast broadband and unlimited does not cost much more. You will need to be in a Sky network area to get the best deals, as otherwise your only choice is Sky Broadband Connect at a comparatively sluggish maximum speed of 6Mb - though it does now offer unlimited usage. While there were no awards for Sky in the 2018 Home Broadband Survey it was third for customer care and the fourth most recommended provider and most trusted provider.